Searching for a long vacation for yourself and your loved ones? Why don’t you visit Ho Chi Minh City, Phu Quoc and Ha Long Bay – three of the most outstanding places in Vietnam? Vietnam Travel Group can guarantee you the best quality time in our beautiful S-shaped country! On the first day of the package tour, you will arrive at Ho Chi Minh City – the most bustling and exciting city in Vietnam. Once arrived, you shall be picked up by our friendly English-speaking tour guide from Vietnam Travel Group. On this very first day, you will have time to explore the wonderful streets as well as the nightlife of local people in Ho Chi Minh City. On your second day of the package tour, you shall have the chance to experience the bustling city of Ho Chi Minh and the historic outskirts of Cu Chi. Venture to the impressive network of tunnels in Cu Chi, and then make your way to the lively city for a tour some of its most popular destinations and markets. At 7:45 AM, you will be picked up by your guide from Vietnam Travel Group before making the drive to Cu Chi. Along the way, stop at a rest stop for a quick break at the local handi-craft lacquer workshop where you will have a great chance to meet local disability workers and witness their skill to create such beautiful products. It is not compulsory to buy anything there unless you want to support those local workers. Upon your arrival, explore how the Viet Cong lived and fought underground in these intricately constructed tunnels. As you head below the surface you see hidden entrances, traps, bunkers, hospitals, and kitchens. 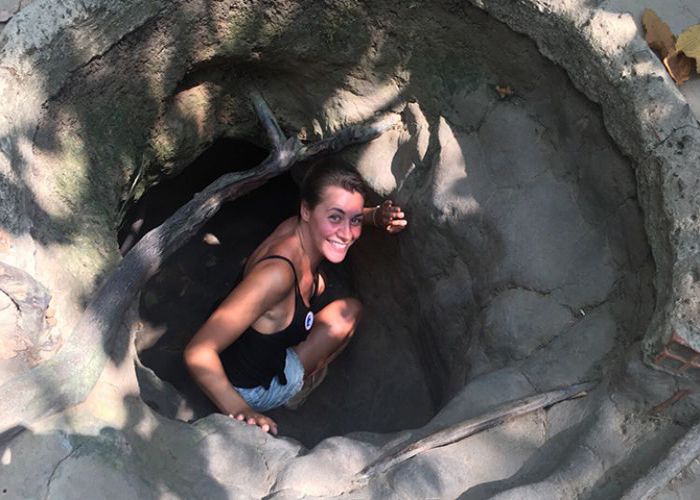 Cu Chi Tunnels is an important war base during the wartime of Vietnam, so by visiting the place, you will have a more significant look about the magnanimous history of our country. On the afternoon, you can explore the wonderful normal life in Ho Chi Minh City by sightseeing some outstanding places such as Ben Thanh Market - where you can find vendor-lined streets with colorful arrangements of produce and crafts and the War Remnants Museum to view the vast collection of wartime images dedicated to journalists and photographers who died during the French and American conflicts. Also, you can visit other amazing places such as The Reunification Palace, Notre Dame Cathedral, and the Central Post Office – all of them are considered the significant symbols of Ho Chi Minh City. Mekong Delta is one of the most famous tourist destinations in Vietnam, where many foreigners stop by and spend their vacation. Here you can explore tiny villages perched along tranquil tributaries, browse the goods at a colorful floating market, and taste silky sweet coconut candies washed down with honey tea. Tiptoe across a creative bridge, watch noodle makers at work, and see traditional folk music performed by locals on this 2-day tour. 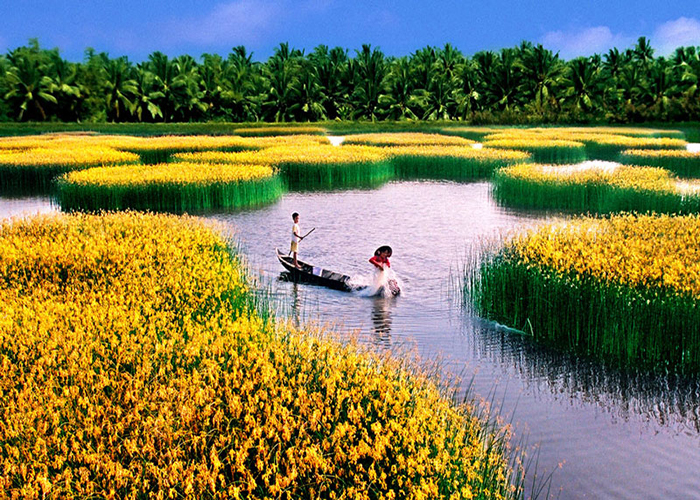 Adding to that, you can watch rice paddies flecked with charming farms pass by as you make your way to the quaint fishing village of My Tho. Board a boat bound for the islands of the Tien River, and then cruise to Ben Tre to check out dense coconut groves. Taste decadent coconut candies and sip hot mugs of honey tea before grabbing a scrumptious lunch featuring freshly caught fish and river shrimp. 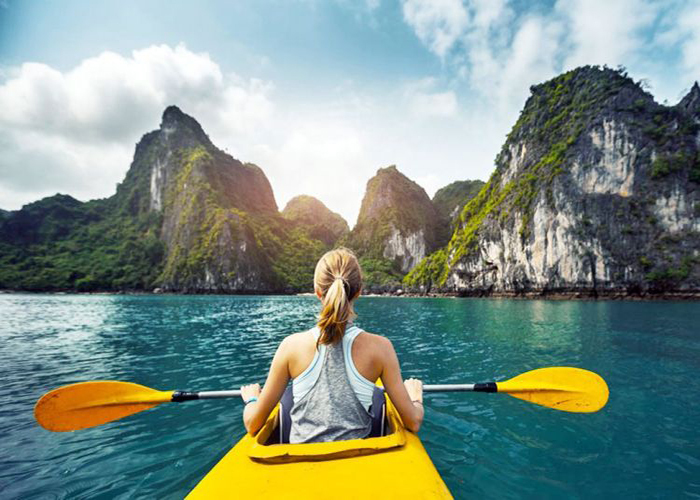 Mekong Delta may be considered the highlight of this Ho Chi Minh City – Phu Quoc – Ha Long Bay tour, so make sure to bring your camera and enjoy this wonderful place! Your schedule for the fourth day is quite simple, yet very exciting and wonderful. At 7:00 AM after breakfast, you shall take the morning boat trip to visit the largest floating market in Can Tho (Cai Rang) which is at its busiest at this time of day, then keep cruising through the small channels system and visit a rice noodle making village. You can also experience the “Monkey Bridge” in the Delta, and walk through the fruits garden, see the process of noodles making. At 2:00 PM, you will change to public bus to reach Rach Gia City. And then by 5:00 PM, you will arrive in Rach Gia bus station then transfer to the hotel. After that, you are free to enjoy the peaceful landscapes in Rach Gia. Here you can make sweet memories with your loved ones as well. On this day you will reach the second destination of the package tour from Vietnam Travel Group, which is Phu Quoc island, at about 10:30 AM. Phu Quoc Island is such a beautiful place with many breathtaking sceneries that can capture the heart of every tourist stop by. On your fifth day, you shall visit the Eastern Island, including the wonderful places like the pepper garden, Ham Ninh ancient village where you can enjoy fresh seafood, the Tranh Stream – the most beautiful waterfall in Phu Quoc, the Hung Long/ Phap Quang Pagoda located on high hill, the Duong Dong town where you can taste the local wine and the Dinh Cau Temple - the savior of local fishermen. 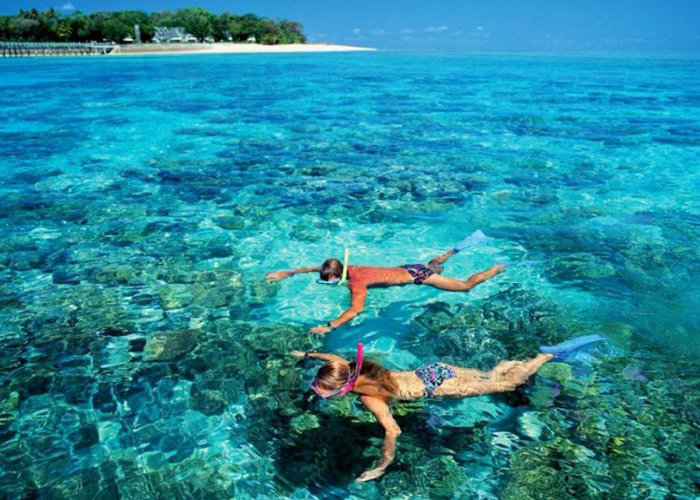 On your sixth day, you will have two options of vacation, which are the Excursion tour or the Snorkeling tour. Each option has its own joy so you really should consider carefully before choosing one. For the detailed itinerary, you can visit vietnamtravelgroup.com or contact us anytime. In order to depart to Ha Long Bay, you will have to return to Hanoi capital first. 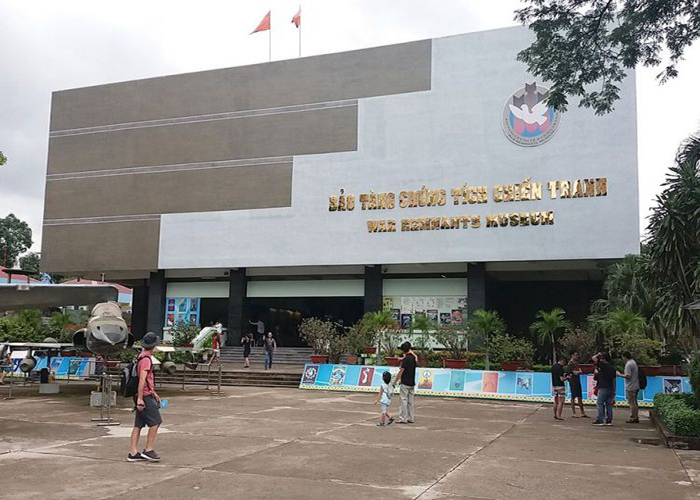 Here you will have a short but memorable day in the capital of our beautiful S-shaped country, with the outstanding places such as Ho Chi Minh Mausoleum and Museum, One Pillar Pagoda, Ethnology Museum, Military Museum or Fine Art Museum, Dong Xuan market, Hoan Kiem lake, Tay lake... Then you can go back to the hotel and prepare for the next part of the package tour. At 12 – 12.30 approx, you will arrive at Tuan Chau marina to be welcomed aboard the cruise. From then on, you will start your wonderful day in Ha Long Bay. You can visit the Surprising Cave, the Titop island area for swimming and snorkeling or do the short trek to the top of the island to have the overview of Ha Long Bay from here. These are the highlight of every Ha Long Bay tour, so you won’t be disappointed. Besides, you can also enjoy interesting activities on the cruise, so your Ha Long Bay vacation won’t have a single boring moment. On the ninth day of the tour, you can freely enjoy the activities on the cruise, such as the tai chi class, cooking class and so on, before checking out of the cruise. Before leaving, you still have the chance to mingle yourself in the stunning views of the Ha Long Bay and its dramatic limestone islets. You shall sail through the calm emerald waters heading to Luon Cave to take your option either exploring the cave yourself on kayak or comfortably on bamboo boat rowed by the locals. This will be an unforgettable experience of you in the stunning Ha Long Bay. You will understand why this place has been recognized as the World Natural Heritage by UNESCO twice before. The trip with Vietnam Travel Group will absolutely delight you. There isn’t much to do on your last day with us. You will have breakfast at the hotel, then have some free time for leisure. Then our car transfers you from the hotel to the airport to take the flight back home. If you are ready to spend the whole 10 absolutely lovely days with Ho Chi Minh City, Phu Quoc and Ha Long Bay, don’t be hesitate to book a tour with Vietnam Travel Group. We are thrilled to serve you and wish you the best time in our beautiful country.